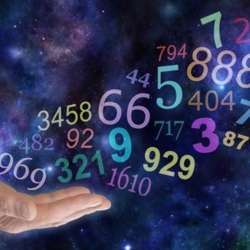 A Special Investigation Into Numerology! You are invited to a vibrant exploration into the mystery of numbers and how they affect you. Pythagoras and other philosophers of the time believed that because mathematical concepts were more "practical" (easier to regulate and classify) than physical ones, they had greater actuality. St. Augustine of Hippo (A.D. 354–430), wrote: "Numbers are the Universal language offered by the deity to humans as confirmation of the truth. Some Chinese assign a different set of meanings to the numbers and certain number combinations are considered luckier than others. Traditional Chinese Medicine (TCM), and its associated fields such as acupuncture, base their system on mystical numerical associations, such as the “12 vessels circulating blood and air corresponding to the 12 rivers flowing toward the Central Kingdom; and Protected content of the body, one for each day of the year” being the basis of locating acupuncture points. There is also the mystery of the Fibonacci series which is a series of numbers in which each number ( Fibonacci number ) is the sum of the two preceding numbers. The simplest is the series 1, 1, 2, 3, 5, 8, etc. Fibonacci sequences appear in biological settings, such as branching in trees, arrangement of leaves on a stem, the fruit sprouts of a pineapple, the flowering of artichoke, an uncurling fern and the arrangement of a pine cone, and the family tree of honeybees. Kepler pointed out the presence of the Fibonacci sequence in nature, using it to explain the (golden ratio-related) pentagonal form of some flowers. Field daisies most often have petals in counts of Fibonacci numbers. There are also various numerology systems which assign numerical value to the letters of an alphabet. Examples include the Abjad numerals in Arabic, the Hebrew numerals, Armenian numerals, and Greek numerals. The practice within Jewish tradition of assigning mystical meaning to words based on their numerical values, and on connections between words of equal value, is known as gematria. We are already counting down to our next meeting!